This is a perennial plant that has a range of uses from the home garden to the grazing industry. A native to Australia, Atriplex nummularia is used widely in South Africa. Although it is widely used as a forage plant, you can use it as a hedging plant, and Old Man Salt Bush can be easily pruned with hedging shears. The foliage is also use in cooking, both as a food wrap for baking fish as well as dried and crushed. Also useful as a screening plant in arid areas. With attractive foliage and being easy to prune, this is plant that can also be used as a hedge, or as a filler plant in the dry garden border. Old Man Saltbush or Atriplex nummularia has a long deep root system and is efficient at converting water to plant material. A valuable plant for grazing, regeneration and for use in saline affected soil. Best grown in full sun to a little shade, a free draining soil is essential. New plants will require additional water through the first season until the tap root develops. You can grow the plant in containers if required. Atriplex nummularia – Old Man Saltbush which has the better root system, is a little less palatable to stock however has better nutritional variety. Atriplex nummularia ‘de Kock’ – This variety is known to have not only a better root system but is also more palatable to stock than the species. 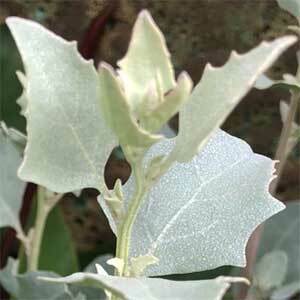 Grown from seed in many cases Atriplex nummularia requires a position in full sun and a well drained soil. Occasional flooding is tolerated and after flooding or heavy grazing it recovers well. Seeds are best sown in the autumn or spring and are often soaked in water before sowing to increase germination rates. Seed should be sown near the surface 1 to 2 mm deep. Also available as tube stock. Propagation is also possible from cuttings, usually taken in spring as terminal cuttings of around 15cm which seem to provide the best strike rate. Young plants require a little care, they are not as drought tolerant as established plants. You are best to water new plants for a few weeks, especially through the first summer, however never let the soil get soggy or waterlogged. Old Man Saltbush seedling specialists and producers of other bulk seedling crops such as trees, shrubs, vegetables, herbs or flowers.